Jewishness On Display: 'Truth' By Way Of Discomfort A new exhibit in Berlin's Jewish Museum is intentionally provocative. The point, one curator says, is to "get people talking about how they perceive Jews, particularly in Germany today." At the center of the controversy is a display in which a Jewish person sits inside a glass showcase and answers questions from visitors. 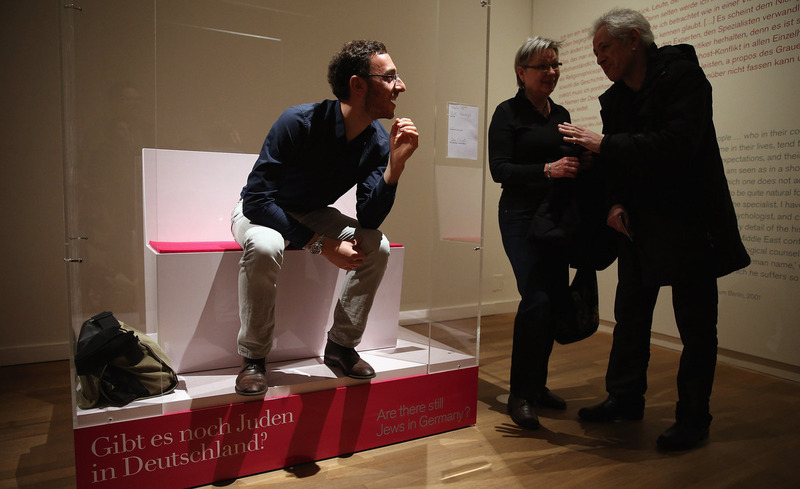 Bill Glucroft, an American Jew living in Berlin, chats with visitors from his box in the most controversial portion of the Berlin Jewish Museum's exhibition "The Whole Truth." In Berlin's Jewish Museum, a new exhibit called "The Whole Truth" asks visitors uncomfortable and even absurd questions about Jews. One of the curators, Michal Friedlander, says it is intentionally provocative. "The point is to get people talking about how they perceive Jews, particularly in Germany today," she says. But some German Jews accuse the museum of going too far. Visitors to the 30-part exhibit are bombarded with questions but given few answers. Friedlander, who is Jewish, says the idea is to get people to think about whether they stereotype Jews. 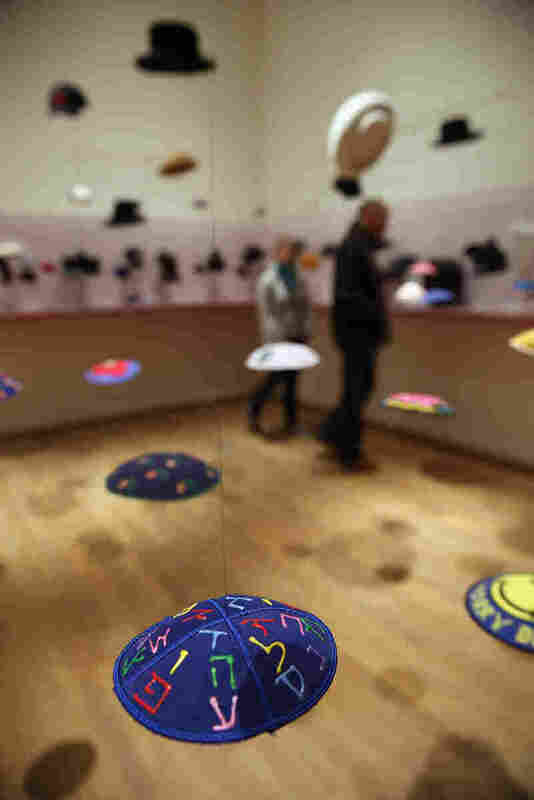 They are given plastic tokens to toss into one of five receptacles, each of which Friedlander says represents an answer to what attribute best describes Jews. "Are they particularly business savvy? Fond of animals? Influential? Intelligent? Or beautiful? The most common reaction I've had from people is: 'I didn't know Jews were fond of animals.' As if all the other stereotypes were OK," she says. The exhibit also gets visitors to think about whether it's OK to joke about Jews. There are televised skits, like one from Saturday Night Live about how "Jews control the town" when Christians celebrate Christmas in New York. But it's another stop in the exhibit that's generating the most controversy: One where a Jewish man or woman sits inside a glass showcase and answers questions from visitors who approach. Bill Glucroft is one of the people who has taken the hot seat. For two hours, the 27-year-old from Fairfield, Conn., explains his take on religion, customs and life. A German visitor asks him, "Can you stop being a Jew?" "It's not like we have a central authority figure like a pope to answer to," Glucroft responds. He pauses, and then quips, "But we do have to answer to our mothers." Glucroft says some of the questions are hard. "But I think, generally, it's healthy and a great opportunity for Jews and non-Jews to have an excuse to meet, because they wouldn't meet otherwise," he says. Not everybody thinks putting a Jewish person on display is the way to educate Germany's post-World War II generation, however. "I was asked to take part in it," says Stephan Kramer, a prominent Jewish leader in Berlin who visited the exhibit, "and I declined because I thought it isn't a good idea to sit in a glass cage and answer questions like an animal in a zoo." Another Jewish leader from Berlin, author and lawyer Sergey Lagodinsky, also refused. "For many, Jews are not friends or colleagues at work," he says. "Jews are people from TV or from history books. So that places, automatically, Jewish individuals behind an exhibit glass in a museum in the heads of the German population." Both Lagodinsky and Kramer say it would be more important to get Germans to interact normally with the country's Jewish communities. They say people need to address actual problems faced by those communities, such as anti-Semitism. But Friedlander says the museum's "Jews in a showcase" display encourages dialogue. "Here we have Jews who live here and Jews who thrive here, and that is the message I want to get across," she says. The Berlin exhibit continues through Sept. 1.